Docking Village Hall is available to hire for groups, functions and parties. If the whole of the hall is not required, the separate sections of the hall can be booked individually. These can be seen in more detail on the Facilities page. 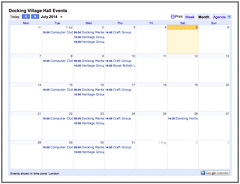 The times and activities for which the hall is already booked can be seen on the Events page of this website. Once your request has been accepted, it will be necessary to download, print and complete the Booking Form here and mail this, together with your deposit payment. If necessary, a blank Booking Form can be sent to you for completion and return. Cost of hire includes heating, water and electricity. A £50 deposit is required against damages for wedding party hire. Docking Village Hall has a music license but no alcohol license. All persons or organisations hiring the hall must agree to, and abide by, the standard conditions of hire. These can be viewed in the PDF file here: Conditions of Hire for Docking Village Hall.